I purchased the CH375 ISA to USB adapter from Taobao, hoping for an easier way to transfer files to my PC XT clones. At a cost of 145 Chinese yuan (around US $23) per card, or approximately US $30 per card with shipping, this seems to be a very good price. Although the Taobao web interface is available in Chinese only, it works well when translated to English using Google Chrome and accepts payment via Mastercard, so I was able to make the purchase with no issues. In the above photo, the ISA bracket has been removed. It is however recommended that you always connect the ISA bracket, to prevent inserting the card in reverse (the ISA connector is just 8-bit and will fit in either way), which may destroy both the card and the motherboard. First I want to say a few words on the CH375. It was originally released as a USB interface module specifically designed for mass storage devices such as USB thumb drives. There are several variants of the module available on eBay allowing interface via SPI or a proprietary serial protocol. As for the CH375 USB to ISA adapter, it is originally designed by lo-tech and makes uses of the CH375 chipset to allow connecting USB mass storage devices to machines with only 8-bit ISA slots. where 260 is the address of the card and 07 is the software interrupt for the card. You should select an available interrupt, otherwise there will be weird issues when reading/writing to the card. If you are using the PCI version of the card, pass 0 as the address. The driver also accepts a third optional parameter that can be anything between 0 to 255, specifying the read/write speed. The higher the value, the faster the speed. Default value is 2. With the above configuration, I was able to create a new DOS drive letter for my USB thumb drive and access it with no issues. The throughput is around 8KB/s on a PC XT running at 12MHz. I guess the speed should be much higher on 386 and 486 machines. Take note that loading CH375DOS.SYS will freeze the system if the USB drive is larger than 512MB, not formatted as FAT16, or contains multiple partitions. Also, only USB thumb drives are expected to work. USB hard disks will most likely not work as intended, unless used with an external power supply. ROM v1.3 from lo-tech. This ROM simply prints “Start CH375 v1.3 …” in an infinite loop after POST, followed by repeated beeps, and you’ll have to reset the machine. ROM v1.5 with Ctrl prompt. This ROM adds a message “Press Ctrl to start E-Disk” during POST. The window for pressing Ctrl is less than 1 second. Pressing too early and it would cause the BIOS to report keyboard error. Pressing it late and your machine would have already booted normally. I could not get this ROM to work. ROM v1.5 (modified) without Ctrl prompt but hard-coded strange disk geometry taken from this discussion thread. This ROM removes the Ctrl prompt and attempts to boot directly from USB but assumes a disk geometry of 0x20 sectors per track and 0x40 heads, which would not work with most thumb drives. I decided to start my analysis from version (3) of the ROM, using IDA Pro and information from the above discussion thread, together with my Minipro USB programmer. If you want to try, the first thing to do is learning how to properly prepare the ROM file. For the CH375, the board accepts a ROM size of 8KB, but various downloads only provide ROM sizes of 2KB or 4KB. If that is the case, use a hex editor and append zero to the end of the file until the size is exactly 8192 bytes before programming. There might also be another issue with the ROM checksum, which is the last byte of the ROM calculated by taking the byte value of last 8 bits of the sum of all bytes in the ROM (including the checksum bytes). Depending on the firmware of your ISA to USB card, the card will either recognize the ROM as long as the checksum matches, or will recognize the ROM only if this checksum byte is zero. To cater for this, if the ROM you attempt to flash does not have zero as the last byte, you will need to modify existing bytes to get a checksum of 0. This can be done by modifying the padded zero bytes, or one of the displayed ASCII characters. In the above screenshot, the card is located at 260h and the BIOS assumes a USB drive having 63 sectors per track and 255 heads (approximately 528MB), the usual limitation for older BIOSes. With this settings, any modern USB drive should work, albeit at a much smaller capacity. You can download a ZIP file with CH375DOS.SYS and the patched 8KB ROM file here. There is still a step that needs to be done before you can use your USB thumbrive with this BIOS. Even though the CH375 recognizes the USB thumb drive, you must first get your DOS system files on it first before the machine can boot. And you can’t do that from a DOS boot disk, nor from Windows, due to the need to have the BIOS loaded first and the hard coded disk geometry. The only way I could get it to work is to create a DOS virtual machine in VirtualBox with a hard disk containing a single active partition of 500MB, then follow this tutorial to convert the disk image to DD format, and finally use Rufus to write the DD image to the thumb drive. Once then, my XT machine could boot using the thumb drive connected to the CH375 to USB adapter. There are still a few issues with this BIOS. First, I think the code is not optimized and the throughput can be faster. Secondly, FDISK and several other disk utilities do not detect a fixed disk when using this BIOS. As a result, formatting the disk is impossible and I have to resort to using the above DD method. Also, this BIOS does not provide a way to boot from floppy disks, so I had to resort to using System Commander for floppy disk boot selection, resulting in the lengthy boot delay. 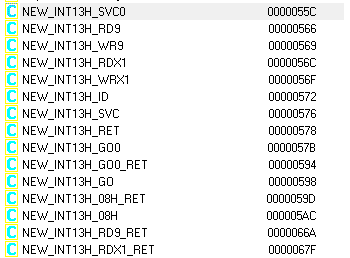 One last thing that I want to mention is that, this BIOS ROM does not map itself into the 8086 memory address space. Therefore it is not possible to dump the ROM contents from software, for example, by using DEBUG.EXE or any ROM dump utility. Download the entire set of files that I have for the CH375 here. The ZIP file contains complete documentation (circuit schematics, datasheet) for the CH375 and similar modules, PCB/PLD designs, DOS tools, BIOS collections, as well as sample application. Some of the README.TXT files were originally in Chinese but have been translated by me to English using Google Translate – these files are given an .ENG extension. I hope these files will be useful for those who want to explore the adapter more and perhaps write a better BIOS for it.